The star in this recipe is actually the red cabbage. Yet again it is something that you can freestyle to your hearts content. Add some orange juice or why not some orange peel? Stir in some herbs. Use some golden syrup instead of the honey. The variations are endless. This time I used it with meatballs but it goes very nice with some roast pork. Try it with your Christmas ham. I'm not sure when or where I first ate this side but I guess it might actually have been at a smorgasbord around Christmas time back in Sweden. There is no need to just eat this around Christmas though, it is equally nice year round. As you will notice in the ingredient list, I won't/can't give any exact measurements this is something you cook to your own taste. In the meantime put the cabbage in a frying pan on a low to medium heat. Add the rest of the ingredients and stir well. Taste and adjust the proportions as you go along. Cook until most of the liquid is gone and the cabbage is well heated through. 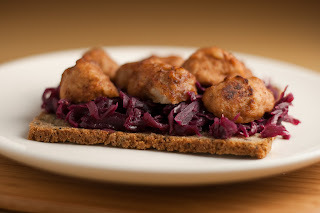 Divide the cabbage mixture onto bread slices and finish off with halved meatballs. Hi, I've just created a new website for UK food lovers, where you can share food recipes, food articles and food video's. I am looking for members to submit some content before the site goes live. I would be grateful if you could have a look and maybe help me out by submitting some articles or recipes. Jag tittade precis in pa din blogg och maste saga att den slar min ganska enkelt. Lysande bilder och mycket bra recept.